: Lean, active dog. Though strongly made, should show plenty of daylight under body and should not look too heavy. Bright, enquiring expression is a distinctive feature. : Alert, lively, self-confident and active. Steady, intelligent working dog, with no signs of nervousness or aggression. : In proportion to size. Whole effect being that of a dog with strength of muzzle and plenty of brain room. : Broad, flat and square. : Large and square, generally black but normally following coat colour in blues and browns. Nose of solid colour without spots or patches. : Strong and equal in length to distance between stop and occiput. : Of solid colour without spots or patches. Pigmentation follows nose colour. : Toning with coat colour, set widely apart and large, soft and affectionate, not protruding. Pigmentation of eye rims follows nose colour. Eyebrows arched up and forward but not so long as to obscure eyes. : Of medium size and drooping. When alert, ears lift at base, level with, but not above top of skull, increasing apparent breadth of skull. : Length of back comes from length of rib cage and not that of loin. : Deep, giving plenty of heart and lung room. Ribs well sprung but not barrelled. : Set low, without kink or twist. and long enough for end of bone to reach at least point of hock.. Carried low with an upward swirl at tip whilst standing or walking, may be extended at speed. : Legs straight and vertical with good bone, covered with shaggy hair all round. : Lower leg falls at right angle to ground and, in normal stance, is just behind a line vertically below point of buttock. : Double with soft, furry and close undercoat. Outer coat flat, harsh, strong and shaggy, free from woolliness and curl, though slight wave permissible. 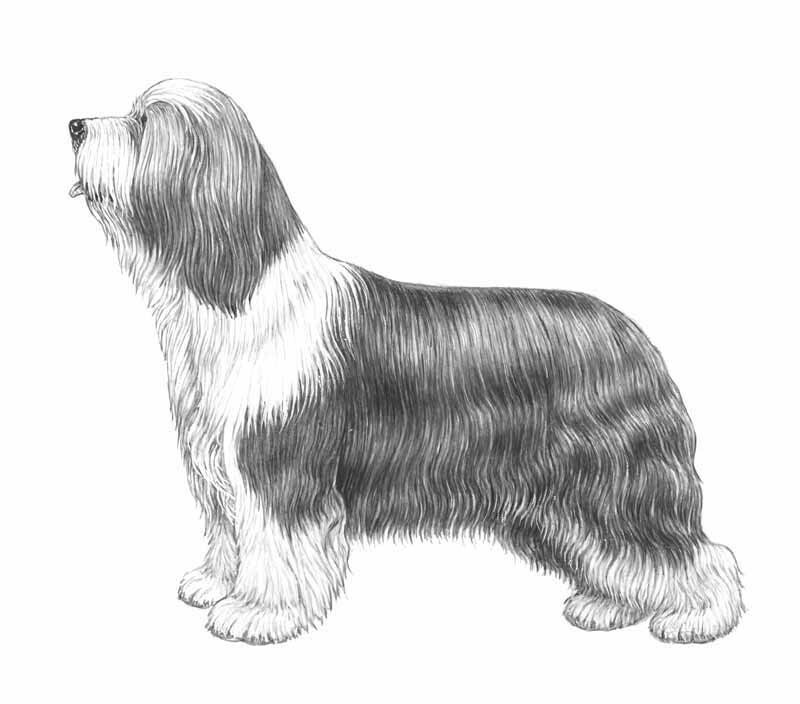 Length and density of hair sufficient to provide a protective coat and to enhance shape of dog, but not enough to obscure natural lines of body. Coat must not be trimmed in any way. Bridge of nose sparsely covered with hair slightly longer on side just to cover lips. From cheeks, lower lips and under chin, coat increases in length towards chest, forming typical beard. Slate grey, reddish-fawn, black, blue, all shades of grey, brown and sandy with or without white markings.